The surgeonfish or acanturidae (of the genus Acanthurus) are probably one of the most popular and sought-after families of marine fish in our hobby. 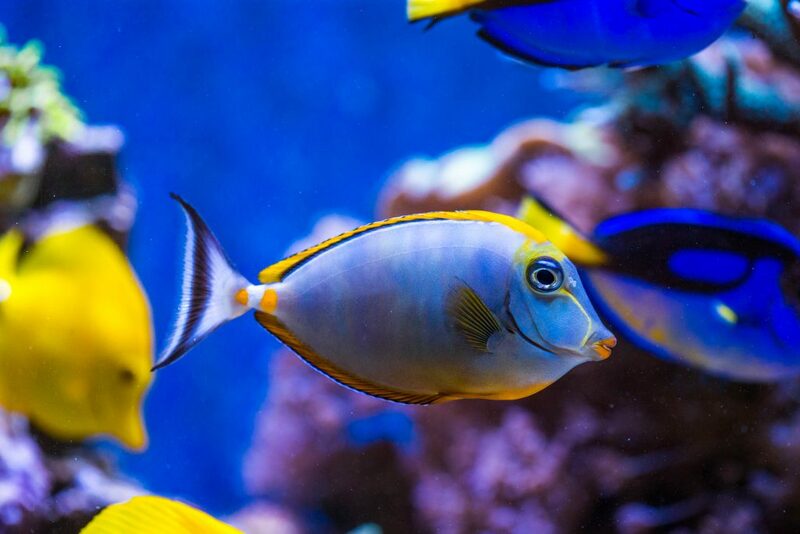 Most of the surgeon fish are mainly herbivores, they move wandering through the coral reef in search of vegetation. These fish are very active swimmers and cover huge stretches of coral reef during their search for food. 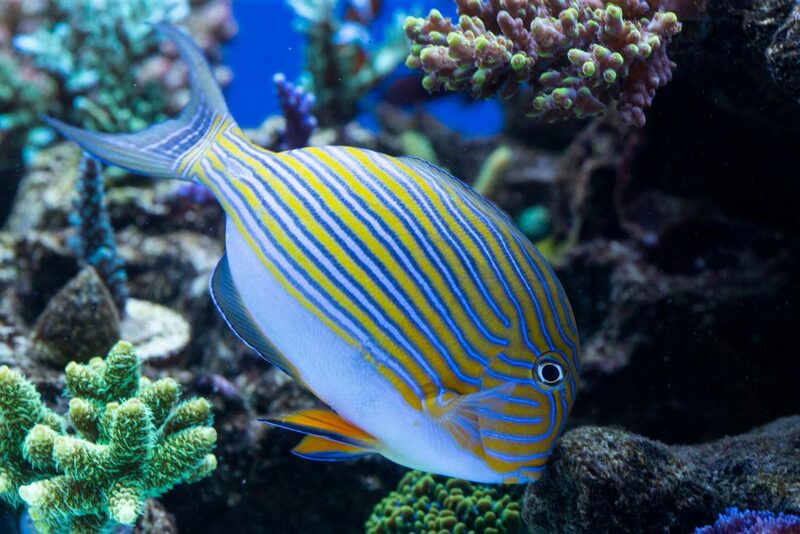 Many species of acanturidae readily adapt to life in the aquarium and can therefore be safely added to reef aquarium or as they often say, reef. The goal of a conscious and responsible aquarist is to provide the optimal environment for the inhabitants of our small glimpse of the ocean. Moreover it is assumed that an optimal environment can never be achieved, nevertheless over the years the continuous observation by enthusiasts and scholars of the behavior in captivity of these fish has allowed, if nothing else, to draw up a short list with the minimum dimensions of the aquarium for the various species of acanturids commonly available on the market. These recommendations are based on the experiences of a myriad of aquarium enthusiasts, both of real experiences related to the observation in the natural environment, the coral reef: they are based on the objective of providing an environment that corresponds to the active nature, to the feeding regimes and at the growth rates of this fish family. sufficient, of the equation. Much more important is, for example, the geometry, the length of the tank in particular. It should be “obvious” that the tank provides an adequate presence of mature live rocks for the “grazing” of the fish, that the acquascaping (the preparation of the furnishings, of rocks and corals) provides sufficient space for hiding and resting, which however, the pool allows a swimming space in a straight line, as if it were in the open sea. Finally, important thing that is often underestimated, it is important that the aquarium friends are compatible. A reef aquarium that guests acanturidae, must be designed for them and not only for the convenience of positioning the corals, full of open swimming space but also caves and inlets between the rocks, so as to minimize stress to the fish themselves. An aquarium, however big it may be, will never be enough for this kind of fish that make their continuous movement a peculiar characteristic. This does not want to be a warning not to include in the aquarium this family of fish which, in reality, will probably have a longer and more comfortable life in captivity than life in a natural environment, full of predators and difficulties. It wants to be just an advice or a wish, to make their existence among our 5 glasses as comfortable for them as possible. 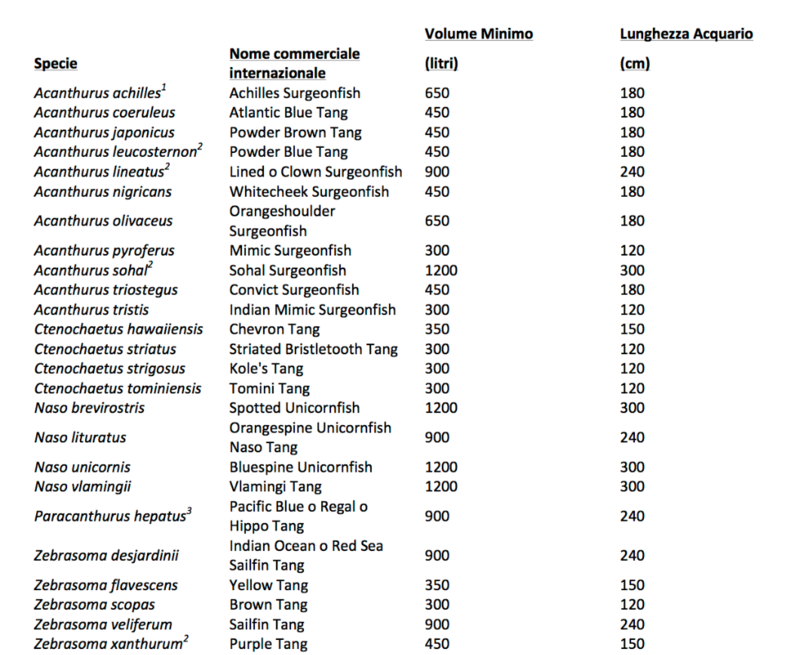 The following list lists the most common acanturides with the name of the species, the common commercial name (in English, for ease of searching for any photographs for identification), the gross volume of the tank and the size of the long side preferable. 1) This species requires a very high level of flow and can represent even more health and nutrition problems than the other species. 2) These species can be exceptionally aggressive and require special attention. 3) These species are particularly prone to infections and must be observed very carefully, possibly always in quarantine.